This winter finds me wrapped in a scarf of Dr. Who-ish proportions and immersed in archival research for my next book, The Digital Poorhouse: Computers, Public Services and American Citizenship. This month, I am looking into the design and implementation of the Welfare Management System (WMS) in New York State in the 1970s and 80s. This system is still used to manage case files and calculate eligibility for a wide variety of public assistance programs — including Temporary Aid to Needy Families (TANF), housing assistance, the Supplemental Nutrition Assistance Program (SNAP, or Foodstamps), and many more — for hundreds of thousands of families in New York. While digging through the files at the wonderful New York State Library and Archives, I came across a 1973 Village Voice article that claims governmental malfeasance in rewarding a contract to computerize welfare and Medicaid, and introduces a surprising to new player in this fascinating story: H. Ross Perot. 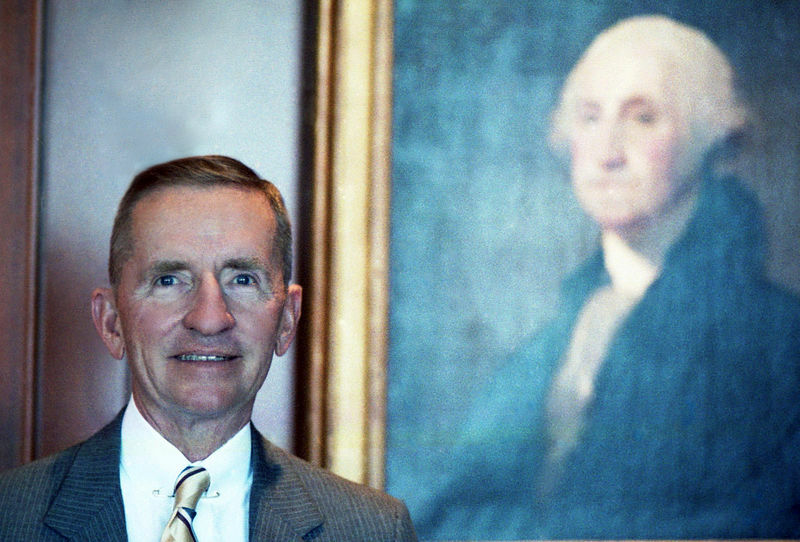 Mr. Perot is most famous for his third party, self-funded runs for the presidency of the United States in 1992 and 1996, on a platform that included eliminating the Federal deficit in five years, reducing the size of government, cutting government spending on the military and entitlement programs, and instituting electronic town halls. Turns out, through his companies Electronic Data Systems (EDS) and Perot Systems, he made a significant portion of his immense fortune–he is the 101st richest person in the United States, according to Fortune Magazine–by computerizing public assistance and government healthcare programs. 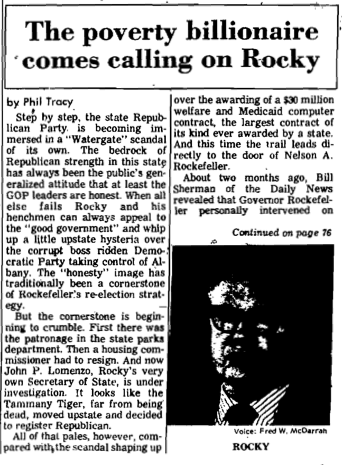 [There is a] scandal shaping up over the awarding of a $30 million welfare and Medicaid computer contract, the largest contract of its kind ever awarded by a state…Governor Rockefeller personally intervened on behalf of computer tycoon H. Ross Perot in order to keep him in contention for a contract to automate and administer the state’s $3.7 billion welfare and Medicaid operation. Originally, nine firms had submitted bids for a $40,000 contract to study current welfare and Medicaid payment systems around the state and propose an automated computerized model, which the companies would then run themslves. Five firms were selected, based on their presentations. H. Ross Perot’s firm, Electronic Data Systems, was not one of the five….Perot immediately contacted the Governor, and on February 9 the Governor, Perot, and Social Services Commissioner Abe Lavine met together to discuss the matter. As a result of that meeting, Perot’s firm was reinstated in the bidding. The number of companies eventually awarded the $40,000 was cut from five to three and Perot’s firm was one of those selected. that a 1970 HEW investigation [found] that EDS was inflating its workload for various Medicare contracts…resulting in over-charges…in excess of $1 million. that in several states EDS was earning excessive profits on its contracts sometimes going as high as 100 per cent. It amazes me how this 1973 tale so clearly anticipates stories ripped right from today’s headlines. Compare the EDS case to the struggle between the state of Indiana and IBM over the contract to computerize their welfare intake, for example. In 1973, EDS was accused of running an unacceptably high error rate, price gouging, and clearing cases in bulk without actually processing them. In 2010, the state of Indiana sued IBM for faileding to fulfill its $1.37 billion contract to privatize eligibility intake for food stamps, Medicaid and other welfare benefits by accusing them of…well…running an unacceptably high error rate, price gouging, and clearing cases in bulk without actually processing them. The only major difference? In the 1970s, EDS cleared those Medicaid cases by indiscriminately approving them. In 2010, IBM did it by unjustly denying poor and working people life-saving assistance, both in individual cases and in bulk. We always hear about fraud in the welfare and Medicare/Medicaid systems, and low-income mothers face sanction, deprivation and jail sentences if they are caught fudging the numbers. So why has no one called H. Ross Perot and IBM CEO Virginia M. Rometty welfare cheats? Good report. I have a disclaimer. I am old and read that Voice story when it first appeared while researching my dissertation at SUNY Albany. EDS eventually was in involved in FL’s welfare reform that we report on in our 2011 book Disciplining the Poor. And people from the successor contractor there were hired away to help launch IBM in Indiana. So the parallels make perfect sense. A billion dollars does’nt go as far as it used to. applied to an efficient operation will magnify the efficiency. The second is that automation applied to an inefficient operation will magnify the inefficiency. Thanks, you a lot, Cz I have found your writing efficient about describing the real demand of present era. It includes almost every important features to broaden the outlook of deserving people.